The shiny of Rohan is not wearing off. 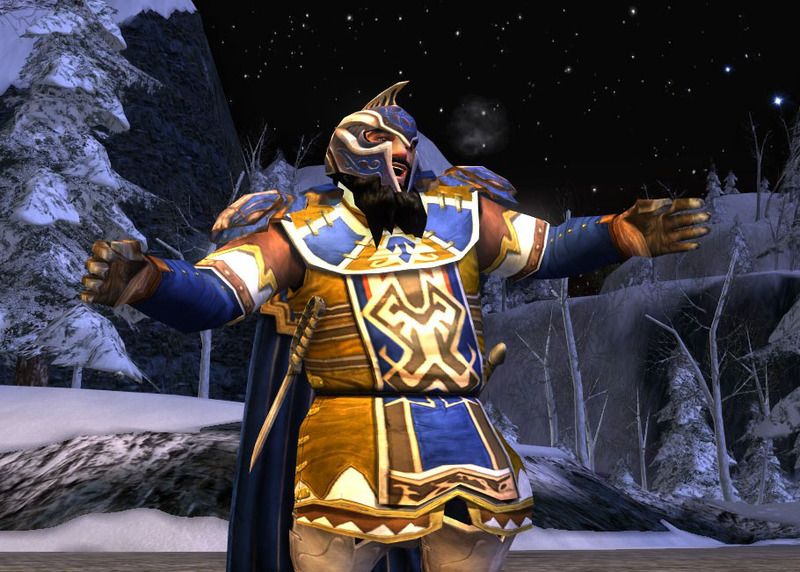 I am dismayed by the price of color packs for our war-steeds (see Cosmetic Lotro’s excellent post here for more details), and uninspired by the barter armour pieces offered for our 8 gabillion tokens. As a cosmetics blogger, that makes things sort of rough. That said…omg, I love mounted combat and racing over the plains and the music and the epic and and and… *breathes into paper bag* The landscapes are stunning. The sound effect of the wind moving across the grasses is just fantastic. The sky! Have you looked up at the sky? I do have a couple of questions that maybe my readership is puzzling over as well. Or, you’ll know the answers and look at me funny, either way. First, has anyone seen a mechanic outside questing (at this time) to raise the various Rohan reputations? I haven’t. That said, has anyone seen any reputation reward vendors? I haven’t. Perhaps that’s coming into the game later; I’m just curious (and still only 80, so there you go). I am still putting together cosmetics ideas — things are pretty limited right now, and after trying three pairs of low shoes and still having clipping issues with the Tactical Eastemnet Campaign Robe, I am going back to destroying things on horseback and listening to cinematic music. Holy overtime, Frodo! I miss you folks! So today, we’re going to do a fun little post about the cosmetics I love the absolute most. This will not be comprehensive because I desperately need sleep, but it will absolutely be Part I! All links lead to source information. May I note, as a cosmetics blogger, that whenever I have a super-awesome idea and log in to show it off, the game is invariably in nighttime mode. First up is the Jacket of the Shade-finder, a chest-piece with fantastic detail and gorgeous use of dye. Yes, I’m taking requests! Anyway, a friend of mine was curious about what sort of items people really like wearing in game, and what sort of item they really don’t. Let me explain: I dislike a number of the festival tunics (a couple are fantastic, though!). Some people feel that there are too many dresses in-game. Some think hauberks are dull dull dull. Some really want to see more separates! More cloaks! More hats! So I’m doing TWO polls today, count them, two. They feature the exact same categories of items. But the first is for you to click on all the categories you like the most, and wish you could see more of in-game. Hauberk-lover? Let me know! Circlet fan? Yay! The second poll is for you to tell me which categories of item make you go ‘meh.’ Are you all, “Dresses, meh”? Are tunics just not your thing? Tell me! In both polls, choose as many as you like, and feel free to expand in comments. And I promise; this’ll be the last poll for a while. We’ve had such an information-gathering sort of week! I’ll share: I love skirts, I love circlets, I love cloaks, I love dresses. I am ‘meh’ about shoes, rather than boots, and about the tunic/trouser combinations. How about you? First, thank you all sooo much for responding to my last post, about why you use the cosmetic clothing system. Fascinating answers; keep them coming! Second, I was switching clothing and items around in one of my house chests and had an idea for a rather tongue-in-cheek poll. So let’s DO it. Multiple choices are fine. And I will confess: I have multiple accounts, which means multiple houses. And a kinhall. And maxed out wardrobes on everyone. And maxed out vaults on nearly all characters. “There is not enough TP in the world” — that’s me. This is a short and sweet one. I’m undecided on whether or not I’ll ever use apparel dummies: I think the concept is interesting, I wish the separates sold as separates, since some pieces are rare and some not-so-much, and I find it odd to see sparkly scarecrows in some of the more remote corners of the world. That said, I’m not offended when reminders of the store pop up in-game, either as objects like the apparel dummies or reminders in the UI. If those very few small reminders get the game all the way to Gondor (and beyond? ), I’m okay with that. 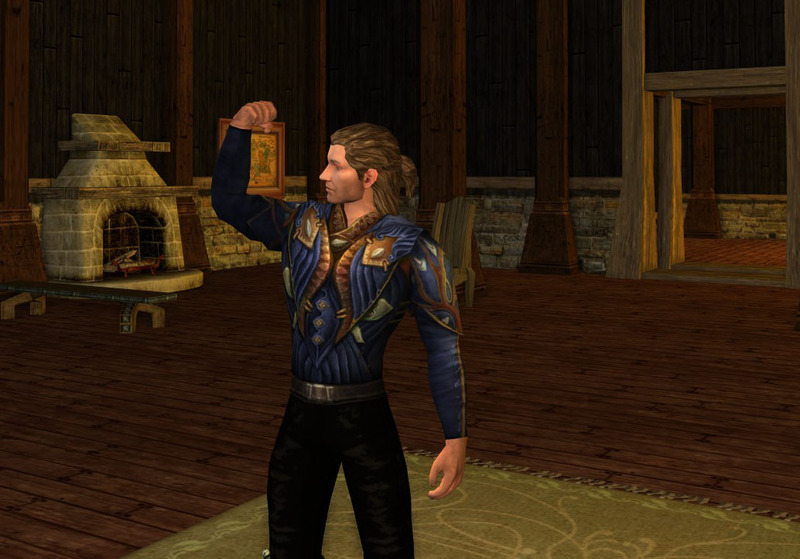 If you’re unsure what I’m talking about, the awesome Hymne of Cosmetic Lotro has a great post here. To sum up my feelings about the apparel dummies: I think the era of huge, subscription-based MMOs (excepting WoW) is pretty much fading. Free-to-play isn’t going anywhere, and while I hope games keep their advertising subtle, I think the apparel dummies are kind of nifty when they’re placed next to vendors in market centers. 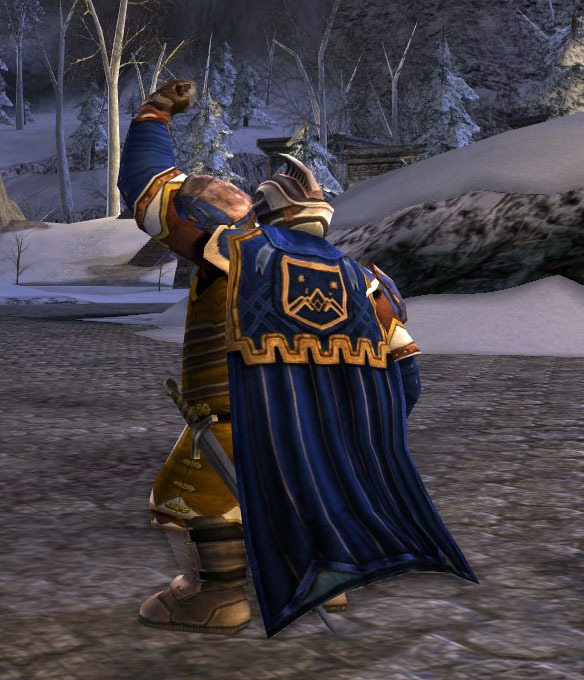 There are some whackadoodle hats in LOTRO. Just saying. I have a few favorites (screenshots after the jump), but a lot of the time, I keep that head slot toggled OFF. What about you? Friday poll time! And now for the screenshots. Wooo! Five days of hauberks, GO! 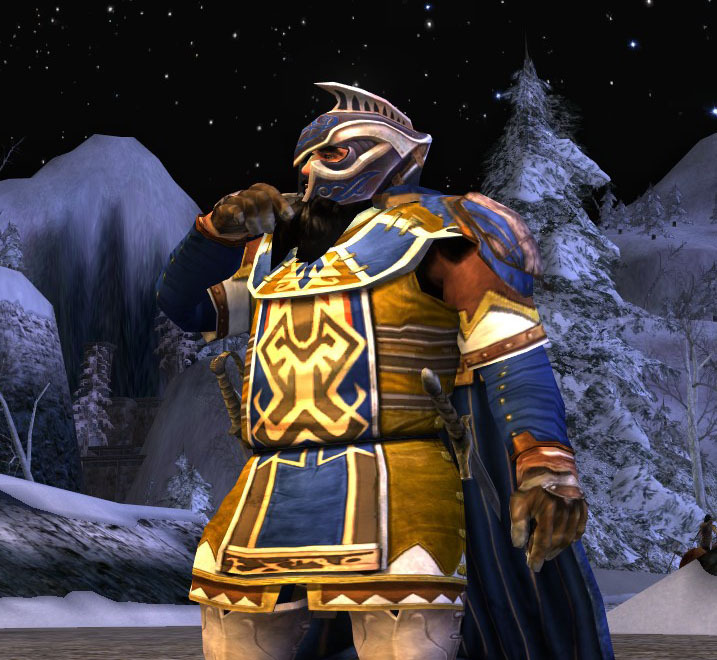 Today, both Ivy and I design outfits around the Dwarf-make Hauberk. Her variation on a theme is right here! I went for bright colors and strong shapes to accompany such a bold hauberk. 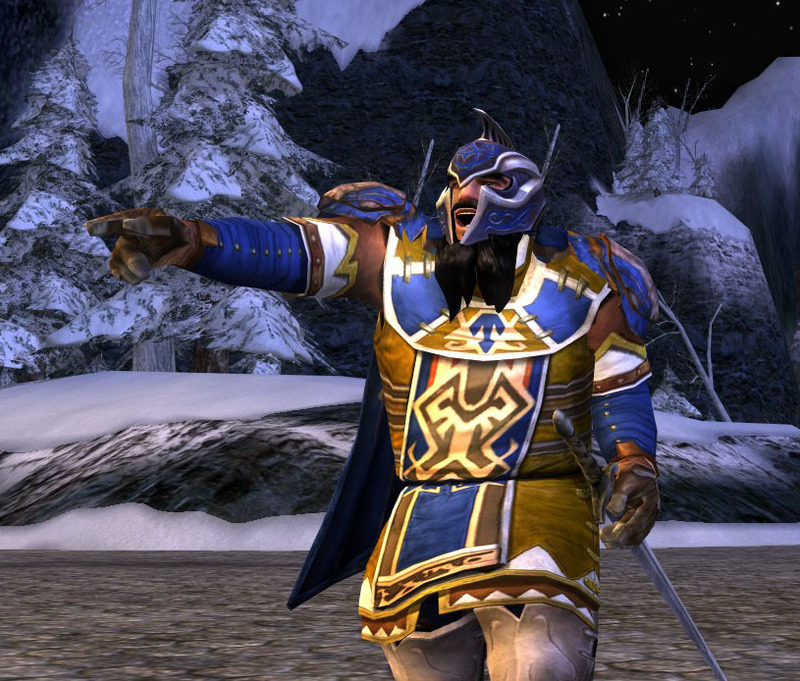 The primary dye is Evendim blue, while the most distinctive additional pieces are the Cloak of Durin’s Crown and the Ceremonial Rift-Defender’s Helm. 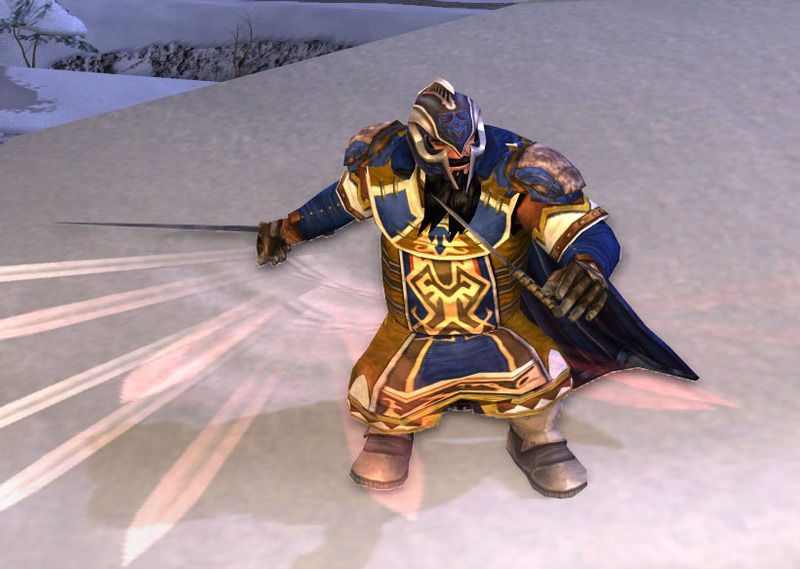 I’ve seen beautiful outfits using the hauberk in black and red, but something about the snowy background and the grey stone of Thorin’s Hall really called for blue to balance the Ranger green, umber(ish), white, and orange details. Yes, orange! Look at the small stripe below the shoulder-piece, and you’ll see that little flicker of color. Check back tomorrow when Ivy and I take on the Eastern-cut Hauberk, and feel free to play along by posting your own outfits with these hauberks in the comments. Thanks!